Celebrity charity auction site ClothesOffOurBack.org has listed a few items that some voice actor fans may be interested in bidding on: two bottles of 2008 Merlot wine autographed by Hank Azaria (The Simpsons, Anastasia) and Mila Kunis (Family Guy, Robot Chicken), and a dress donated by CCH Pounder (Justice League, Batman Beyond). Both auctions end March 1, 2011. Proceeds benefit various children’s charities. In a bit of related news, Paul Rugg (voice actor and writer on Freakazoid and Animaniacs) has announced that he is going to be auctioning off animation cells and memorabilia from shows he has worked on to help raise funds for Angels Way Maternity Home in California. Paul has a video on his Froynlaven! blog showing many of the items he’ll be donating from his own collection. We’ll provide an update when his auction officially begins. The Clothes Off Our Back Foundation is a 501c3 organization that hosts charity auctions showcasing today’s hottest celebrity attire. Items are put up for bid to the public with proceeds going to benefit children’s charities. Clothes Off Our Back was founded by actors and philanthropists Jane Kaczmarek (“Malcolm In The Middle,” “Raising the Bar”) and Bradley Whitford (“The West Wing,” “Studio 60 on the Sunset Strip”) whose efforts, along with their celebrity and designer friends have helped improve the lives of children across the globe. For more information and to bid, log onto www.clothesoffourback.org. Originally a news brief, this post has since been expanded into a feature article to commemorate 20 years of “The Simpsons” by spotlighting the show’s voice cast and guest stars. Please scroll down for the most recent updates. NYDailyNews.com has a pictorial showcasing “The Simpsons 20th Anniversary Special: the faces behind the iconic cartoon” which includes 56 photos of the principal cast and many of the show’s celebrity guest stars over the last two decades and the characters they voiced. Of note are some of the lesser-recognized members of the supporting cast: Frank Welker, Pamela Hayden, Maggie Roswell, Marcia Wallace, Tress MacNeille and Russi Taylor. Elsewhere, Macleans.ca blogger Jaime Weinman illustrates how The Simpsons’ cast has helped simple one-shot, castaway characters become recurring fan favorites. I believe fans can also expect an extended “director’s cut” to be released on DVD and Blu-Ray in 2010. – …and several of the shows guest stars such as Sting, Jerry Springer, Conan O’Brien and Hugh Hefner. Documentary filmmaker Morgan Spurlock (Super-Size Me, 30 Days) quite literally traveled the globe speaking to fans of all walks of life. He found the largest single collection of Simpsons merchandise and it was a frightening and beautiful thing to see. It spotlighted just how important this show is to some people, and how much these characters have resonated with generations of fans now. It was also great seeing the interviews with the voice actors, as we so rarely get to see the faces that go with so many of the voices on the show. There are so many great characters on The Simpsons, it’s hard to imagine that so few actors voice all of them. Personally, I would have gotten a huge kick out of seeing them all do their big characters, but maybe that’s just me. The work that goes on behind each episode fascinates me. Elsewhere, National Post columnist Robert Cushman has an opinionated review of Spurlock’s documentary. Update: 8:00 PM (EST) — OnTheBox.com has a review of The Simpsons: Access All Areas, a behind-the-scenes look at the making of the show. It aired only in the UK on SKY1 on Monday, Jan. 11th. Narrated by Ricky Gervais (BBC’s The Office), it featured interviews with the show’s cast and crew, including creator Matt Groening, producer Al Jean, composer Alf Clausen, voice actors Dan Castellaneta and Nancy Cartwright, other of the show’s writers and artists and token celebrities Christina Ricci, Tony Hawk and Simon Cowell (who all voiced cameos in the series). – Update: 8:15 PM (EST) — Video interview with Yeardley Smith on FOX’s Good Day LA. It was actually 22 years ago that the simpsons began for me, so next year when I turn 46, I’ll have been doing it for half my life. Sheesh. “I wish I could say that we inspired an awful lot of funny, smart, irreverent, acerbic shows that took a lacerating view of the insitutions of society. But I don’t think we have,” SNL alum Harry Shearer, 66, who voices Mr. Burns, Waylon Smithers, Ned Flanders, the Rev. Lovejoy, Kent Brockman, Dr. Hibbert and Principal Skinner, told The Associated Press. Shearer, who also pummeled the pretensions of rock music as bassist Derek Smalls in 1984’s magnificent mockumentary “This is Spinal Tap,” said satire doesn’t change anything with its scorn. “For instance,” he said, “after 20 years and 450 episodes, I don’t really think ‘The Simpsons’ has increased the country’s skepticism about nuclear power,” which employs the bumbling Homer as a safety inspector. – Update: 8:45 PM (EST) — TheImproper.com has some behind-the-scenes “secrets” on the show’s celebrity guest voices from Hank Azaria and writer/producer Al Jean. “It made me a little bit annoyed. I knew it was going to get awkward, because I was about to walk upstairs and record with him,” Azaria said. – The Altoona Mirror has a very insightful interview with The Simpsons’ associate producer Brian Kaufman discussing the recording process and directing sessions with the series’ cast and guest stars. At this point, the cast is “pretty tame,” Kaufman said, because they’ve been working together for so long. He said Dan Castellaneta, the voice of Homer, is the “funniest” actor to work with, and he’s amazed by the talent of Harry Shearer, who can hold conversations between the many different characters he voices. Update: 3:15 AM (EST) — Voices.com co-founder Stephanie Ciccarelli blogs via Vox Daily about the 20th anniversary of The Simpsons, explaining the influence the series has had on the voiceover industry and community. 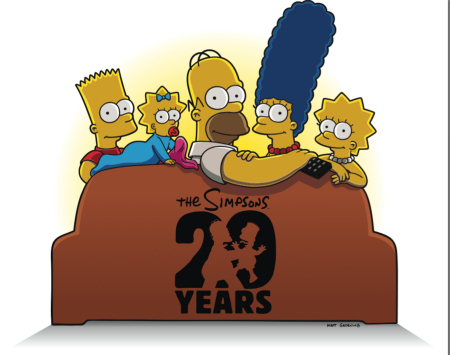 [We] approached Fox Entertainment President Kevin Reilly about how long he sees THE SIMPSONS staying on Fox, now that it’s reached its 20-year milestone. It was one of the many amazing things that happened to me while working on the show. He had said to Jim Brooks, ‘I want to be on the show and I want to write a No. 1 song for Bart.’ And he did and he did, it was No. 1. [Jackson co-wrote — although uncredited — the song “Do the Bartman,” which reached No. 1 in the United Kingdom, Ireland and Australia.] He did come to the table reads and read the script [for the episode “Stark Raving Dad”] but when it came to the singing, he wanted a sound-alike to do the recording and we never really understood why. I did hear him sing and of course he was great. It was one of the coolest things I’ve been involved with. Elsewhere, IGN.com has an exclusive video with a “special anniversary message” from the King of the Hill cast, featuring the voices of Mike Judge, Stephen Root and Johnny Hardwick. – Morgan Spurlock talks with Newsarama about the making of “The Simpsons” documentary. – Harry Shearer and Yeardley Smith reflect on 20 years of “The Simpsons” with the Boston Globe. – Nancy Cartwright says in an interview with the UK’s Press and Journal that she has a history of being mistaken for a boy. Also, NewsOK.com has a short piece celebrating Shearer’s 66th birthday on Dec. 23rd. – Media Bistro has a video interview with “The Simpsons” documentary director Morgan Spurlock. – Yahoo News has an interview with Harry Shearer (via The Associated Press). – The Sioux City Journal interviews Yeardley Smith. Look for more articles to be added to this report in the near future, as several of The Simpsons’ cast have been interviewed recently to coincide with the 20th anniversary of the series. IGN has an interview with Steve Robert, producer of The Simpsons Arcade game which was released Dec. 21st as an iPhone app. Robert says that Gracie Films was “very involved” in the development of the game, and adds that the script was drafted by Simpsons’ writer Michael Price. An earlier press release from game publisher Electronic Arts states that the voices were all recorded “by the real, live actors” and Geek site Kotaku.com confirms that all of the following provided voices for the game: Dan Castellaneta, Julie Kavner, Nancy Cartwright, Hank Azaria and Harry Shearer. Life.com has a photo feature on the individuals they have determined to be “Epic” voice actors. – Mel Blanc: most of the iconic Looney Tunes characters. – Dan Castellaneta: The Simpsons, Earthworm Jim. – Alan Reed: voice of Fred Flintstone. – Seth MacFarlane: creator/producer/writer/voice actor on Family Guy, American Dad!, The Cleveland Show. – Frank Oz: voice of Jedi Master Yoda, Sesame Street characters Grover and Bert. – Matt Stone and Trey Parker: creators of South Park. – Russi Taylor and the late Wayne Allwine: respective voices of Minnie and Mickey Mouse. – Jorge Arvizu: considered to be the Hispanic equivalent of Mel Blanc. – Mark Hamill: voice of The Joker. I had reservations about linking to this because the nitpicker in me believes this list has been mislabeled as “epic” when “iconic” would be more fitting. Also, some major talents have been omitted — no Frank Welker, Daws Butler, June Foray, Jim Cummings, or plenty of others I could mention — all very worthy of the title of “epic” when it comes to voice acting talent. And I would like to have seen more females mentioned other than just Nancy Cartright. It blows my mind that Life would neglect to include “The First Lady of Cartoon Voice Acting,” June Foray. And there are other females who would have been welcome additions to such a list: Mae Questel (Olive Oyl, Betty Boop), Janet Waldo (The Jetsons, Penelope Pitstop), Tress MacNeille (Animaniacs, Futurama), and Mary Kay Bergman (South Park, Captain Planet, Scooby Doo movie series). (And that’s just to name a few). Now, with that off my chest, I will say that it’s nice to see the majority of these individuals featured by a publication as renowned as Life Magazine. (And photos of voice actors are always welcome.) Frankly, Mark Hamill still gets unfair media criticisms for being a so-called “has-been since Star Wars” so any time he’s recognized in the media for his incredible voice acting is okay by me (although you’d think they would’ve tried spelling his name correctly). And as far as I’m concerned, Tony Anselmo, Russi Taylor, and the late Wayne Allwine will never receive enough recognition for their work. The Las Vegas Sun reports that Hank Azaria (The Simpsons, Anastasia, Night at the Museum 2), Brad Garrett (Finding Nemo, Ratatouille, A Bugs’ Life), and Jason Alexander (Duckman, The Hunchback of Notre Dame) are among the celebrity guests participating in the annual “Ante Up for Africa” charity poker tournament which has raised nearly $2 million since 2006. The event will air August 11th on ESPN as a 3-hour TV special. THR TV attends the Star Trek red carpet event in Los Angeles, interviewing Hank Azaria (via YouTube) who ad libs as Comic Book Guy from The Simpsons. Fast-forward to the 1:45 mark to see Hank’s interview. Previous news: 4.03.2009 — Hank Azaria Guests on VH1’s Free Radio. Hank Azaria (The Simpsons, Anastasia) guest stars on the April 9th episode of VH1’s Free Radio. Look for bonus clips and the full episode to be available online following the Thursday, 4.09.2009 11PM broadcast at VH1.com. Elsewhere, The Real Estalker has photos and a detailed description of the new home Azaria recently purchased in Bel Air, CA — to the tune of nearly $14 million dollars. Azaria also appears as “Kah Mun Rah” in Night at the Museum: Battle of the Smithsonian (and is the voice of “The Thinker” in the film as well) which opens in theaters May 22nd, and he has a supporting role in Year One, starring Jack Black, opening in theaters June 19.